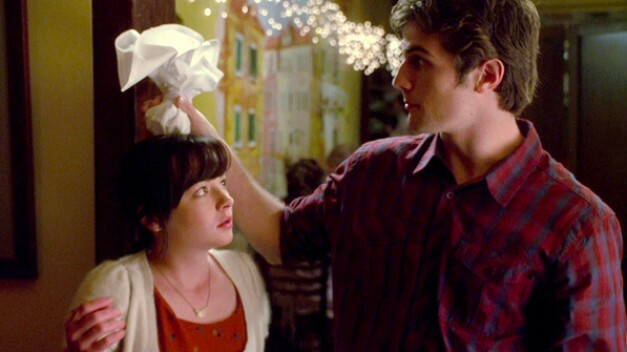 Episode Review: AWKWARD., "My Love Is a Black Heart"
Coming back to MTV's Awkward. after sitting out the last couple of weeks made me realize two things: 1.) I didn't miss it at all and 2.) this show's really not for me. Maybe I would've liked "My Love Is a Black Heart" more if I had been totally caught up, but I doubt it because I didn't find it entertaining ... at all. It's Valentine's Day, which meant that we were in store for so many cliches like the lonely hearts club and misguided declarations of affection. To prep for the holiday, Matty asked Jenna for some pointers on a romantic date, which she took as a sign that he was there getting info for Jake, but boy was she wrong. As it turned out, Matty was getting tips because he was dating some freshman girl, and as luck would have it they were at the exact same restaurant where Jake took her. Not only were they at the same place, but the only open table was right next to them, and insanity ensued. The rest of the night became a series of "awkward" moments as Jake kept bumbling up while Jenna spent too much time and energy on being jealous and wondering if Matty was there to sabotage everything. Of course he wasn't; he was just trying to be a better person so he didn't screw things up with this new girl like he did with Jenna. Thankfully the date's over, and Jake capped off the evening by telling Jenna that he loved her, which of course she replied with, "awesome." Meanwhile, Tamara was still whining about Ricky while getting in the way of Ming's new found fling (of course another Asian kid) at the black hearts party (aka single people complaining about being single). And we got to see some more of how Lacey's coping without Kevin since he moved out. Now, I'm not opposed to Awkward. giving us the obligatory Valentine's Day episode because it is a good source of angst and comedy, but I was very underwhelmed with what the show did with the holiday. Most of "My Love" was either extremely predictable (we all knew Jake was going to say "I love you" and Jenna wasn't going to say it back) or extremely tired (how much lonely heart non-sense do we need). Had we actually gotten something new and interesting, then I would've been more entertained, but it all felt like more of the same teenage drama. It wasn't all bad though because I was happy that Ming got to do something besides being the token Asian, and we had to endure very little of Valerie. So, there's that at least. I missed the church camp episode, and I'm kinda bummed that I did because I'm starting to like Lissa, and I'm sure she had some gems. Sadie, on the other hand, I could do without. I know that Jake's supposed to be cute and adorable due to his awkwardness, but I still don't get what Jenna sees in him. Man, I cannot stand Tamara. I can fully admit when a good show just doesn't do it for me, and it's starting to look like Awkward. is going to end up in that category. I'm going to stick it out with hopes that I start appreciating it again like I did last year, but it's probably not likely.